Availability: Please allow 90-120 days for delivery. 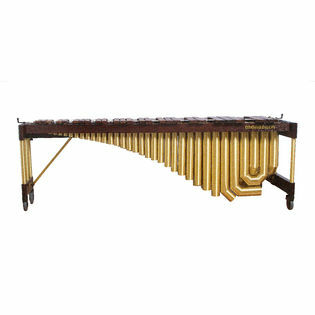 The Malletech MA 5.0 Imperial Grand 5 Octave Marimba may be the pinnacle of marimba design. Featuring a solid oak frame and brass hardware, the MA5.0 is visually stunning. Extra wide rosewood bars and fully tunable brass resonators provide excellent sonics. The Malletech MA 5.0 sits atop a height adjustable frame. The frame itself is specifically designed to make setup and breakdown quick and easy. I've tried every brand of marimba out there and nothing comes close to my MA 5.0. Not only does it have an amazing sound but the price is competitive with marimbas using cheaper box resonators that cost a fraction of the amount to make. Dollar for dollar, this is the best marimba on the market in the 5-octave range.